The term ‘concrete poetry’ denotes both a poetic genre and an international movement. Concrete poetry emerged simultaneously in Germany, in Sweden and in Brazil in the early 1950s, and then spread to other countries. The Swiss-Bolivian poet Eugen Gomringer and the Brazilian Noigandres poets are considered the founding fathers, who have defined the genre in various essays and manifestos. Concrete poetry reached its peak in the 1960s, and gradually fizzled out in the early-mid 1970s. Concrete poetry can be considered a more rigidly defined sub-genre of visual poetry. ‘Structure=Content’ is one of the most famous and minimalist definitions of concrete poetry, coined by the Noigandres poets in their ‘Pilot Plan for Concrete Poetry’ from 1958. Above all, concrete poetry creatively operates with space as an additional expressive category by arranging words in non-linear patterns across the page. ‘Concrete poetry begins by being aware of graphic space as structural agent’, the Noigandres poets write. 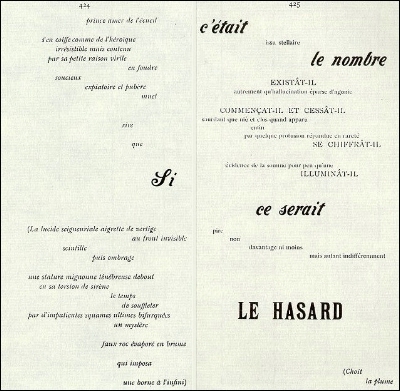 Drawing upon both textual and visual modes of signification, concrete poetry is thus a hybrid between text and image, and forces readers to oscillate between reading and viewing modes. Concrete poets explore the material dimension of language, its visual, acoustic and semantic aspects. They endeavour to create autonomous linguistic realities, in which the perceptual qualities of the signifiers (the signs) rather than merely the signifieds (the concepts they refer to) are emphasised. One of the mainstays of concrete poetry is an emphasis on structure, method, functional construction, and a rejection of subjective expression. Conceptual tenets of the fine arts, in particular constructivist and concrete art, serve as models and inspirations, as well as modernist and historical avant-garde poetry, by Mallarm�, Apollinaire, e. e. cummings, the Dadaists and the Futurists most notably. The concrete poets also strive to respond to changes in the media landscape and for conceptual affinities to emerging technical languages, which were becoming ever more reduced, swifter, formally simplified and condensed. Concentration, reduction and concision, key features of poetry in general, are thus taken to a new level in the minimalist productions of concrete poetry. Concrete poetry puts the reader centre-stage: it offers merely incentives, naked linguistic structures, mental play-areas, but it is up to the reader and his or her poetic imagination to fill in the blanks. Greene, Roland. “From Dante to the Post-Concrete: An Interview With Augusto de Campos”. The Harvard Library Bulletin, 3.2 (Summer 1992). Solt, Mary Ellen (ed. ).�Concrete Poetry. A World View. Bloomington and London: Indiana University Press, 1970. Williams, Emmett (ed. ).��An anthology of concrete poetry. New York and Stuttgart: Something Else Press, 1967. Anna Katharina Schaffner, ‘Extracts from an interview with Stephen Bann’ (18 November 2010, Canterbury). The complete interview will be published in Concrete Poetry: An International Perspective, edited by Claus Cl�ver and Marina Corr�a (Amsterdam; Atlanta: Rodopi, forthcoming in 2011). Anna Katharina Schaffner Kim Knowles, Ulrich Weger and I are currently running a series of experiments testing how people perceive concrete poems by measuring their eye-movements and modes and patterns of attention at the University of Kent. We investigated whether our participants read or scan these works, whether they look at space or compress it. We wanted to find out which code dominates, whether the verbal or the visual code attracts attention first, and how space is actually ‘read’. Stephen Bann That has been done already for paintings, testing saccadic eye-movements, in an attempt to find out whether the Western eye always reads from left to right, whether there are inbuilt cultural procedures that determine perception. But I think it is difficult to apply that lesson to concrete poems in general. Take Eugen Gomringer’s ‘silence’ constellation as an example. Surely nobody would try to read all the individual occurrences of the word ‘silence’ in sequence? Readers observe straight away that there is repetition, and presumably understand that the poem addresses them on another level. Gomringer also uses inversion as a formal feature, which undoubtedly creates an effect of visual balance to counteract the process of reading in sequence. Anna Katharina Schaffner The specific behaviours are of course poem-dependent, but we generally found that whenever works allow for such an approach, our participants tried to decipher them sequentially. It is only when the participants are forced to, by the more radically non-linear arrangement of the verbal material, that they adapt different strategies. It seems that many of us are predisposed towards the decoding of the verbal message in the first instance, that the linguistic code is the one we are most attracted to, for it requires less cognitive effort. Stephen Bann Ian Hamilton Finlay’s ‘Acrobat’ poem can be read as another commentary on that finding. ‘Acrobats’ is one of the first poems which he put up on the side of a house, using cork letters on a white background. In front of that work, the very fact that we find it difficult to read across diagonal lines of spaced type can be understood as an analogue for the theme of the poem. We are invited to become visual ‘acrobats’, athletic gazers, in tracing the letters diagonally across the whole surface of the work. Alternatively, we might try to read along horizontal lines, in which case we would end up with a sequence of ‘a’s, and so on, which is not a text we would find meaningful. This is a work that reflexively thematizes a strategy of reading, a process that many other successful concrete poems also explore.